Cleaning the microwave was once one of my least favorite chores. Trying to scrub off the baked on gunk was time consuming and it never really looked very clean. 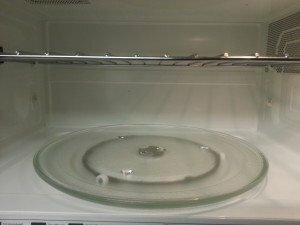 Then I found a very simple way to get my microwave sparkling clean with very little effort. Combine the hot water and lemon juice or white vinegar in the measuring cup and put it in the microwave. Heat on high for 2 or 3 minutes. Wait 5 minutes, then remove the measuring cup and wipe the microwave with a damp cloth or sponge. The acid in the lemon or vinegar, combined with the steam, will help loosen the dried on food and make it easy to wipe off. If there are some stubborn items, just repeat the process. I’ve cleaned some pretty cruddy microwaves with just one session. *I prefer lemon juice because it makes the kitchen smell wonderful. Vinegar will smell a bit vinegary until it dries, then the scent will fade. If you like this tip, please share on Facebook, Twitter, Google+ or Pinterest by using the using the buttons below.